Have you ever wondered the magical significance of your name, or maybe, that your name isn't an accident? When we are born, not only do we get a unique thumbrint, palm lines, a special celestial configuration imprinted in our natal chart -- but -- our parent(s) set a magical intention for us by giving us a name. Every name has a meaning, a history, words that came before to mold it's meaning -- and then the transferral of love and hope that goes into the act of naming -- a magic in itself. Our names may change when we marry, or we may evolve and change our names to something that feels more true, but regardless, we still have a name that we are called by. In a world that sometimes feels devoid of magic and identity, we can look to our names as another north star, a guide that connects us to family, place, and identity. This idea is reinforced in numerology, that each name holds a life path, a soul urge, and more. And then, in many traditions, we get a name day. In the Greek culture -- name days are still kind of a big deal. My name is Demetria Theophania Provatas -- and, if you can't tell, it is ridiculously Greek. It translates out to something that is roughly "of Demeter" "a vision of God" or “of divine manifestion” (another word for Epiphany) and Provatas "a flock of sheep" (insert jokes here). I've always liked that many European last names refer to the trade that your ancestors and family practiced. Provatas means my ancestors and family were shepherds. It helps me to imagine a family with a flock of sheep on the island of Limnos, where my Papou emigrated from. My parents contemplated between the names Penelope, Persephone, and Demeter --- and then decided on Demeter, but changed it to Demetria so that I could be baptised in the Greek church. Nearly every Greek person is named after a saint, or a god or goddess (which shows that your family is less devout) and my name is a saint's name that was adapted from a goddess name. My yia yia, who emigrated here from the region of Thessaly, loved to bake, and my family often attributes my passion for it as a gift from her. My aunt tells stories of how she and her grandmother and aunts would get together in my yiayia's village and make phyllo from scratch, rolling up a big batch on a broomstick handle. Name days are part of an Orthodox, Catholic and Christian tradition, and were supposedly originally encouraged as an alternative to the birthday, which was thought to be a pagan celebration. Something that is a bit funny now. However, as many and most Greek names derive from a pagan tradition, I think it all somewhat blends together. I actually like the idea of celebrating your name day, and all that is held within the meaning of a name as it's own special holiday, as well as the other stories affiliated alongside. In the orthodox Greek calendar each day has been dedicated to a Saint or martyr from the biblical tradition. I grew up celebrating name days as birthdays, and my dad's name days were celebrated with even greater importance. On my name day my dad would come home, wish me happy name day, and give me a card and a box of chocolates. When he was growing up, he would celebrate with a big party, desserts, music, dancing, guests, the whole deal. Since I was born just a few days before the Epiphany, or the Festival of Lights, my parents gave me the middle name Theophania -- meaning the light or manifestion of God -- or Epiphany! So, in short, this month holds one of my name days! To celebrate I made a traditional Greek cake called ravani or revani. 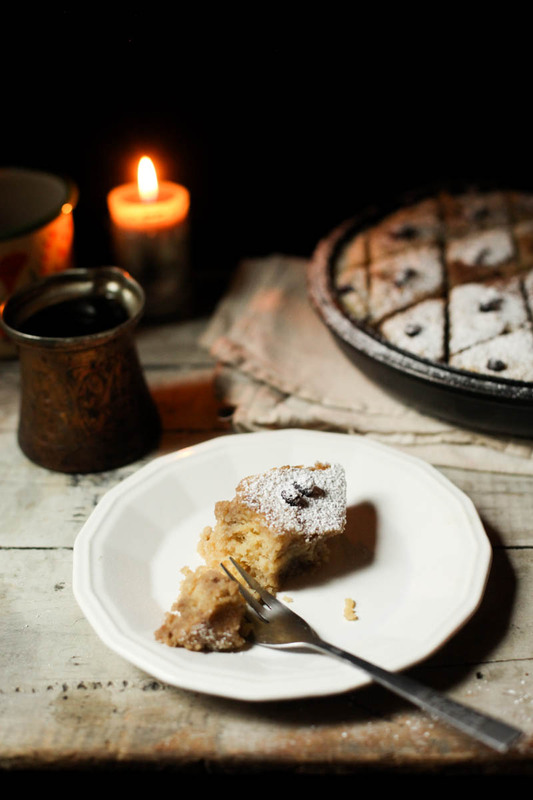 It is in the classification of Greek desserts called "siriopiasta" or drenched in syrup. I've taken to seeing this as an opportunity to add in some medicinal syrups and elixirs. This past year I've continued to view all of our meals as food as well as medicine - and so for this occasion - I added a bit of immune boosting elderberry syrup to the cake. So you can have your cake and your immune support too. Greek desserts are quite sweet, so I'm not sure if you would call this healthy ... but definitely a nice for a special occasion! 1. Preheat your oven to 350 degrees Fahrenheit. Grease a spring form pan with butter. Or I used a 9" cast iron skillet - whichever. 2. With a hand held mixer, or stand up mixer. Beat the butter and sugar together on low to medium speed until creamy & fluffy. Add each egg in one at a time until they are fully incorporated. Pour in the milk and beat well. 3. Slow mixer down to low and add in flour, almond meal, semolina, and baking powder. Mix in the dessicated coconut with a rubber spatula until fully blended in. Place pan in oven and bake for 45 minutes, until a knife comes out clean when poked through the center. 4. In the meantime prepare the syrup. Add the honey, water, lemon juice and peel together. Bring to a boil and then lower heat and let simmer for 10 minutes. 5. When the cake is done, let cool slightly. While it is cooling add the elderberry syrup to your syrup mixture. Pour the syrup very slowly over the cake, starting from the middle and circling around. Cut into diamonds and serve! This cake actually gets better as it sits - it may be better the next day! What is your name? Do you know it's origins and meaning? I'd love to hear stories ! Want to learn how to make pie ?! Come be my summer apprentice. This little pie business is a small scale, hands-on operation located in the San Juan Islands off the Washington coast. I strive to use all organic ingredients and as many local ingredients as I can find .... meaning we are picking a heck of a lot of fruit in the summertime, as well as hitting up farmstands, and using what we've got growing in the garden. I view baking as a beautiful culmination of spirit, science, and art - it's a meditation, on most days. For the summer season we are largely baking for one market on Saturdays, and being the slowest sloth of a person I am this often means I'm preparing 3-4 days in advance. This apprenticeship aims to give baking experience to anyone who is a) simply wanting to know how to make a better pie b) those who are hoping to start a small baking business of their own c) seeking a taste of what running a little baking operation is like d) really any one is passionate about baking. Through the art of trial and error I can share what I've learned over these couple years, as well as the baking knowledge I've accumulated over the 15+ years of studying & working in bakeries. With all this said, baking is hard, repetitive work - with occasional late nights. The best applicants will be excited to work hard, play hard, and really like chopping fruit. I generally make pies and hand pies exclusively in the summer - with the occasional greek pies, pizza pies, any other baking whims. There will also be plenty of room for experimentation and the ideal applicant will be hardworking, creative, and genuinely excited about baking, making pie, and trying new things. We can set aside a day to learn, experiment, and focus on things you'd like to learn. Looking for an apprentice from June 20 to September 10th with a bit of wiggle room on the end date! Over the past couple months our old home apartment has undergone the transformation of our own cozy nest to a baking, photo, and art studio -- and I'm now excited to open up the space further to host artists, activists, and creative folks of all stripes for a 8 - 14 day residency. This is an opportunity for artists, creative activists, politically-minded artists (defined broadly to include writers, musicians, event organizers, fabricators, etc. in addition to visual artists) of any and all mediums to stay in an affordable quiet space, work within a small rural community, or simply seek space from their own. In a broader effort to keep the creativity, magic, inspiration, sharing, and communion alive as well as to support those seeking a bit of solitude, breathing space, self-care. I am opening up our apartment studio for this independent, self-directed, artist residency - beginning a few weeks into 2017. Residents will live and work within a small apartment/rustic loft inside a much larger former old lumber yard building/70's artist commune. The residency can be used as an opportunity for solitude and deep reflection on creative/activist projects or as a space to carry out actions, teach, share, or organize within a very small community. Residencies are encouraged to culminate in an event that showcases and shares the artist or activist's work. 1. Send a brief artist's statement. 3. Send 3 or more media samples of your best work including links to your work online. This is a small apartment studio space in a large, rustic shared building (once a lumber yard, then 70s artists' commune) with a small family on one side and glass artist on the other. Showing respect for them, their space, and this land is very important. There is also oftentimes noise and other activity just from either party on the downstairs level. ALSO, on the upstairs level, if there is a heavy rain, the area around the ceiling skylight will leak. HUGELY IMPORTANT FOR VISUAL ARTISTS AND THE PROTECTION OF ALL TECHNOLOGY/COMPLETED WORKS. The leaks are always limited to this area and I will clearly point them out to you on your arrival ! And finally - water is mineral heavy - perfectly fine for doing dishes and bathing, but we will provide a 5 gallon water bottle for drinking water. If it is a market week I will be in and out and using the kitchen heavily in the couple days leading up to the market -- if you'd like an entirely private residency let me know! Excited to hear from everyone! Taking Thanksgiving Pie Orders ! LOCAL AND SAN JUAN ISLAND FRIENDS! I'm taking thanksgiving pie orders from now until MONDAY the 21st! Using all organic ingredients - local pumpkins from the nearby farm, apples from our backyard, lavender from next door - it doesn't get much more close to home than this! If you meet someone and your heart pounds, your hands shake, your knees go weak, that's not the one. When you meet your 'soul mate' you'll feel calm. No anxiety, no agitation. And even amongst the rush to move in together, get engaged and so quickly share all the bumps of life - adjusting to living under the same roof, and working through those first fights -underneath, like the steadiest stream, has only and always been that sense of calm. When I was dreaming about Woodland Keep - the life I would lead alongside the work - I never imagined I would share it with a partner, it was always a project of solitude. And solitude is still such an important piece, but J is now another piece I hadn't before considered - a nurturing and supportive companion through it all. Earth and water - a fertile ground for growing ideas, bringing them to bloom, creating, and enjoying what we've built. It is, of course, not always sweet, it is sometimes a lot of work, but "being in it together" has brought a steadiness and love that colors all of this in a way I would have never anticipated. As Woodland Keep approaches its one year anniversary I'm thinking more about what will come with Chapter 2. Conveniently enough this cozy space we've nested so hard this past year will transition into my studio (! )(we are moving into a little house! chickens, big garden, nearby all the beautiful hikes!) right at around the one year mark and with that will come so much more room for creative, sharing, making and community possibilities. I've got 5 million ideas but here are a few that are in the works, and just little updates with how it's going over here. 1. Setting up a space in here for silk screening Moon calendars will be back for Year Two. There will be another batch of an updated version of last year's design, for those that didn't get one, and then a completely new design that will come out a bit later. They'll be up for sale in the last week of October! 2. Pies will always and ever continue in market form, the upcoming pie contest ;), and as I apply for new permitting I'm hoping to be in a couple stores on the islands by next year! 3. Maybe finally chocolate bars ?!? 4. A photo portfolio, and digging deeper into analog and fancier digital realms. 5. And most excitingly the slow beginnings of building up an artist residency/baking apprenticeship- stay tuned on that! 1. The herbal immersion course with Chestnut School of Herbal Medicine! I've been looking for an intensive for a while now to accompany the little bit of wildcrafting I've been doing for chocolates and pies and couldn't quite find anything that worked with the busy summer schedule and the largely working on weekends - so when I saw chestnuts program was on sale I jumped on it! Living here the plant world has almost become a greater friend to me than the people. Hikes and walking through our backyard have me communing with plants but knowing little in a more academic sense. So I'm hoping this course will satisfy that hunger for learning and allow me to create ethically grown and harvested ingredients to add to the things I make. I'm so excited to have a full garden with the course too and all of the sweet people I've met already, and I'm excited to share what I learn with you guys! 2. The improvisational dance class I took with Marlee Grace yesterday! Dancing with all kinds of various and beautiful bodies, so inspired by the shapes, movements, gestures. I'm finding ways to just move that way in the day to day (mostly so far alone). 3. An island wedding! If you guys didn't see on the social medias J and I are gettin hitched. I can't say I'm fully excited about all the planning, but I'm v excited about the dancing, flowers, all my loved ones being around, all the people who have already offered to help, good food, community, love - you know, the stuff that makes life nice.